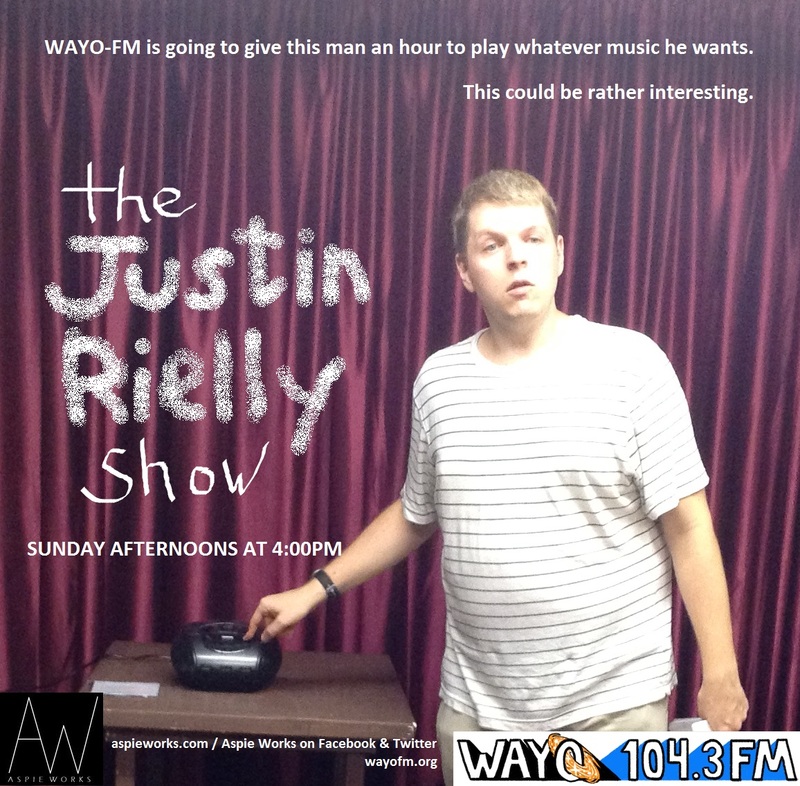 The Justin Rielly Show | WAYO 104.3FM Rochester, NY | Way out, right here. It's free-form music programming mixed with perceptive interviews with local creators - just the way it should be...brought to you by the mind behind Aspie Works. This episode features former journalist turned local political figure Rachel Barnhart, who discusses the creation and plans for her new organization Rochester for All; features music by John Lennon, Otis Redding, Patti Smith, Jackson Browne, R.E.M., The Corrs, Leonard Cohen and Violet Mary. This episode features actor Linda Starkweather and writer-technical advisor Lynne Westmoreland, as they prepare Linda's show "Traveling with a Broken Compass"; features music by Bruce Hornsby, Robert Palmer, Swing Out Sister, Betty Hutton, Daryl Hall and John Oates, The Psychedelic Furs, Led Zeppelin, Mandolin Orange and Janet Jackson. This pre-recorded episode looks at highlight conversations from the show's first 100 episodes, featuring devoted fan Laura Bastida, singer-songwriter Sylvie Lynn, improv performer Danielle Erway, Rochester Brainery co-founder Danielle Raymo, WallByrd artistic director Virginia Monte and the late actor-producer Carl Girard. The first of a two-hour special features actor-director Jeff Siuda, who talks about Out of Pocket's tenth season and their latest show "Echoes"; includes music by Supertramp, Thunder Body, Kings of Leon, David Bowie, Genevieve, Frank Zappa, Mr. Mister, Paul Carrack, Chicago, Nik Kershaw and Tom Petty and the Heartbreakers. This episode is the conclusion of a two-hour special (even if there are no guests); includes music by Supertramp, Annie Lennox, Bobby Long, The Outfield, Cutting Crew, Violet Mary, Stan Ridgway with Stewart Copeland, Bruce Hornsby, Patti Smith, U2 and Billy Joel. This milestone 100th episode features appearances by the Kingfisher Theater trio of Kevin Dedes, Amy Canfield & Jess Meyer-Crosby, Screen Plays founder Karen Tuccio and ShakeCo director/WAYO DJ Philip Frey - and even a French-inspired opening from guest and fan Laura Bastida; features music by Tom Petty, Bruce Springsteen, Sylvie Lynn, Walk the Moon, Sam Bradley, Susanna Rose, Crowded House and Violet Mary. This episode features Lauren MacDonough and Colin Pazik from Pittsford Musicals' production of "Sweeney Todd," along with music all from its legendary composer Stephen Sondheim; along with "Sweeney Todd," music is featured from the shows "Saturday Night," "West Side Story," "Passion," "Merrily We Roll Along," "A Funny Thing Happened on the Way to the Forum," "Company," "Gypsy," "A Little Night Music" and "Sunday in the Park with George." This episode features DVC director Mario Savastano and musician Claire Janezic, as they talk about the group's performance of the Bruce Springsteen-influenced show "American Skin"; includes music by The Box Tops, Frank Zappa, Cream, Mandolin Orange, Billie Holiday, Bruce Springsteen, Bobby Long, Jude Cole, Nina Simone, Marc Cohn and The Beatles. This episode features several performing artists at the Rochester Fringe - singer/songwriter Susanna Rose and the "Allen Wrench" team of writer-director Kevin Dedes & actors David Autovino, David Jacobs and Rachel Romack; featuring music by The Beatles, Susanna Rose, Emma Stone, Grateful Dead, Beth Orton, The Outfield, Chicago, Amanda Marshall and Sara Bareilles. This episode features several theater artists performing at this year's Rochester Fringe Festival - Penny Sterling ("Spy in the House of Men"), Reenah Golden ("We All Write Presents: Birth Write") and the team of Emmett Michie, Jahaka Mindstorm, Anderson Allen & Gary Dewitt Marshall ("12 Dollars"); features music by Violet Mary, Bill Withers, Miles Davis, Robert Randolph and the Family Band, Rod Stewart & Ronald Isley, and The Replacements.